The U.S. Patent and Trademark Office (USPTO) has published a newly granted Apple patent titled “Small form factor high-resolution camera”, that details best in class sensor technology paired with complex optics to produce a compact, high-performance camera for future iPhones and iPads, AppleInsider reports. Apple’s patent details a spherically curved photosensor that receives incoming light, refracted through special lenses onto a concave surface. In order to fix diffraction and visual aberrations that propagate within small cameras, the proposed lens system includes three lenses, two of which are substantially convex. A third meniscus lens, or a lens with opposing convex and concave surfaces, is situated between the first two lens elements and the spherical photosensor. This unique arrangement provides a comparatively small ray fan spot size for all field heights at the image plane, allowing for sharp, low-distortion images. Apple says that employing a curved array limits diffraction across the image field (it scores high in point spread function and modulation transfer function metrics), thereby allowing for a smaller photosensor with equally tiny pixels. Further, with an axial length of two millimeters or less, the total camera package is incredibly compact. The setup does come with a few drawbacks, however, the most prominent being native barrel distortion, or a bubble-like warping. 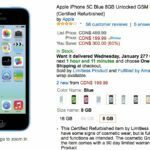 Apple proposes a software solution for correcting such unwanted effects. 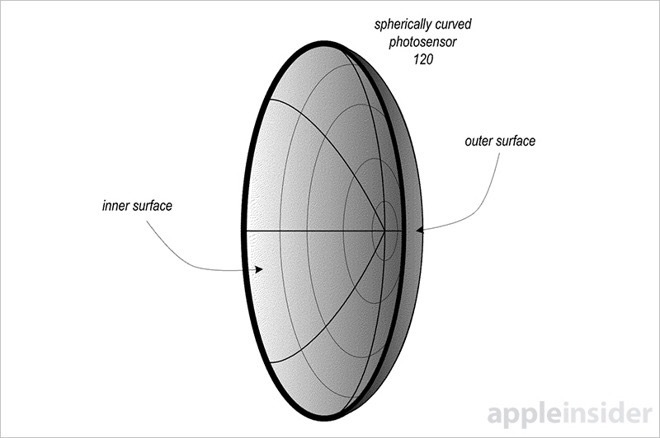 Apple’s curved spherical photosensor patent was first filed for in 2013.